Monday: Jan Drexler gave us some ideas for mining our family trees for story ideas. The winner of a copy of "The Amish Nanny's Sweetheart" is Bettie Boswell! Congratulations, Bettie! Tuesday: Toni Shiloh hung out with us on Tuesday, talking about diversity in writing... and the winner of an e-copy of "Returning Home" is Kiersti Giron! Congratulations, Kiersti! Wednesday: Melanie Dickerson continued her Conflict and Tension series helping us answer the questions: Are you having trouble coming up with enough conflict in your current WIP, have you mined your characters' worst fears? Their goals and motivations? Their childhood scars and traumatic events? Check out her Regency series, too. They're on sale this month!! Friday: Pam Hillman led us through the process of writing seamless transitions from scene to scene. Smoothing out the rough edges. A post every writer needs to read! Wednesday: Laurie Schnebly Campbell is returning! She'll bring us "Selling Without Bragging," a post on the editor/agent pitch. She'll also be offering free registration to her class Perfecting Your Pitch to one luck commenter! Friday: Gabrielle Meyer will be chatting with us about how to keep those creative juices flowing. Stop by and tell her about your creative pursuits and what inspires you! Sunday is the last day to enter the Cowboys of Summer Blog Tour Giveaway on JustRead Publicity Tours. Cowboys of Summer is a sweet contemporary romance novella collection with stories from Mary Connealy, Lorna Seilstad, Cheryl St. John, Missy Tippens, Tina Radcliffe & Sherri Shackelford. See any familiar names there? 😉 Today's stop includes an interview with Seeker alum, Tina Radcliffe! 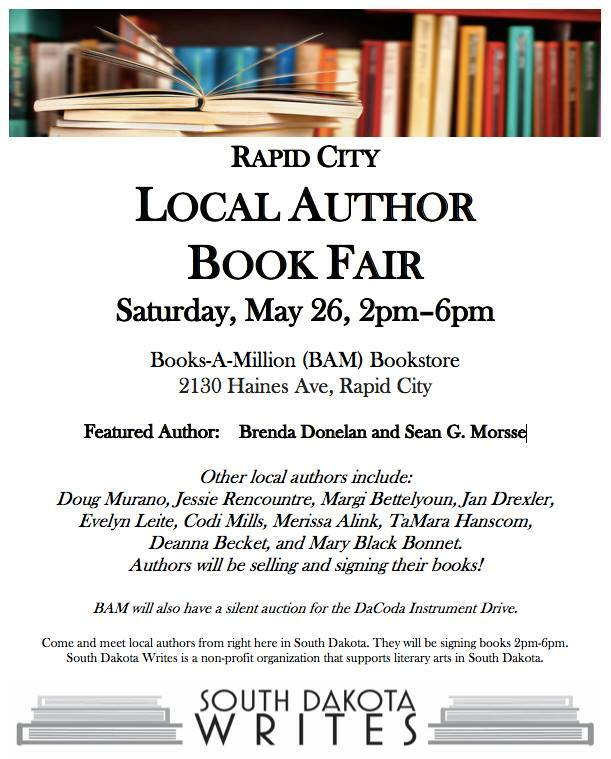 Jan is having fun hanging out with other local authors at the Rapid City Books-A-Million store! 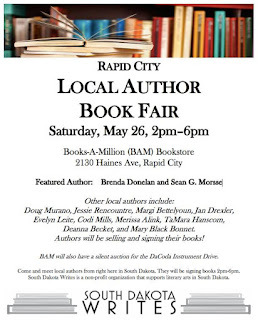 Stop by and say hello if you're in town! How to Nurture Your Author Platform for Effective Results by Belinda Griffith at Your First 10k Readers blog. I mined Pam's information yesterday, went to a café and spent an hour working on transitions in a section of my WIP. I brought the doughnuts. I will serve them buffet style, as people are in and out on Saturdays. That sounds like a fabulous use of your time! Grabbing a doughnut! Thanks, KB! Kathy, thanks for the doughnuts! I'm glad you got some good work done! Have a great Memorial Day weekend, everyone. I'm sure the book signing will be a huge success, Jan! Enjoy! I hope the signing went well, Jan! Mine will be an adventure. Tropical storm Alberto is already affecting me. I am falling over, the world is spinning, my head feels like it is about to explode, ears are hurting. Welcome to my world. In spite of all this the Lord is good and I can rejoice in Him. On my agenda for today. I will be working on visuals for teaching the preschoolers in Sunday School and Children's Church. I also hope to do some writing if my body allows me to think and focus, reading as long as the spinning allows. Looks like house work may need to wait for another day. Seeing as I will be sitting or lying down all day. So glad the Lord is good. Thankful for all my friends who have served in the military. Praying for your relief, Wilani! And bless you for teaching preschoolers. :-) I teach preschoolers, too. It's my favorite Sunday School age group! The change in barometric pressure must bother you severely, Wilani. I'm so sorry! Praying the storm passes by quickly with little problem. Stay safe and dry! Wilani, I'm so sorry it's hit you again! Will pray for safety in this storm. Prayers for you, Wilani. Hope you feel better soon. Happy Memorial Day Weekend to all and God Bless our fallen military heroes! This has been an exciting week for me with the end of the school year and lots of events to enjoy with my grands! Being with family is always extra special! Hope you have a wonderful weekend! I'm giving thanks for all those you gave their lives for our country and our freedom. We had high school graduations this weekend. Congrats to any grads in our Seekerville families! We're proud of you all! Debby, I'm glad you enjoyed the grandkids! 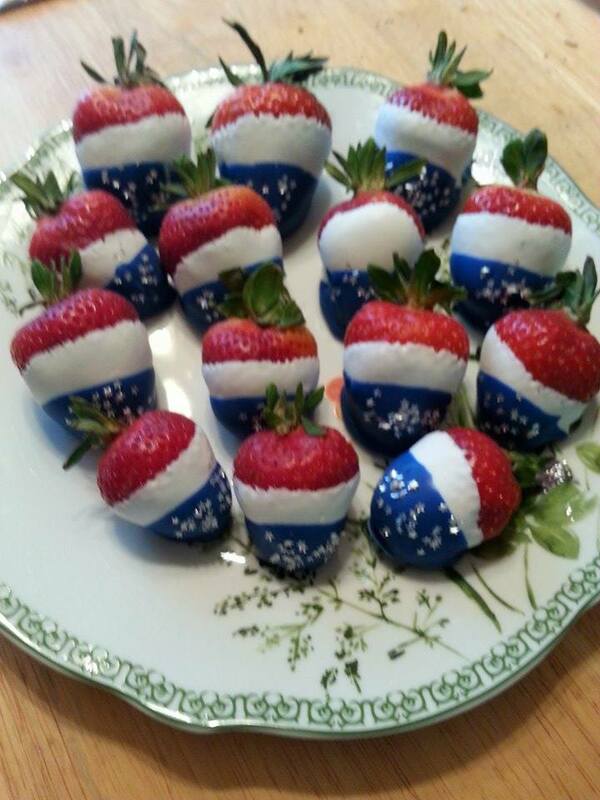 I hope you all have a great Memorial Day weekend! I'm so grateful to those who've died for our country. Hope everyone is having a great holiday weekend. I worked at the book store last night and will for a few hours on Monday afternoon. But relaxing today for my birthday and will celebrate with my dad and my brother and family on Monday evening. Happy Birthday, Sandy!!! Can you hear me singing? I've brought cake and ice cream too. The 24th was my birthday. Special people have May birthdays, right? Thanks, Debby. May is a special month for a birthday!